1.2. What makes the nanoscale important? Chapter 8. Is It Worth the Effort to Reinforce Polymers with Carbon Nanotubes? Carbon Nanotube Reinforced Composites introduces a wide audience of engineers, scientists and product designers to this important and rapidly expanding class of high performance composites. 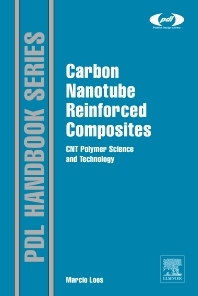 Dr Loos provides readers with the scientific fundamentals of carbon nanotubes (CNTs), CNT composites and nanotechnology in a way which will enable them to understand the performance, capability and potential of the materials under discussion. He also investigates how CNT reinforcement can be used to enhance the mechanical, electrical and thermal properties of polymer composites. Production methods, processing technologies and applications are fully examined, with reference to relevant patents. Finally, health and safety issues related to the use of CNTs are investigated. Dr. Loos compares the theoretical expectations of using CNTs to the results obtained in labs, and explains the reasons for the discrepancy between theoretical and experimental results. This approach makes the book an essential reference and practical guide for engineers and product developers working with reinforced polymers – as well as researchers and students in polymer science, materials and nanotechnology. A wealth of applications information is included, taken from the wide range of industry sectors utilizing CNT reinforced composites, such as energy, coatings, defense, electronics, medical devices, and high performance sports equipment. Introduces a wide range of readers involved in plastics engineering, product design and manufacturing to the relevant topics in nano-science, nanotechnology, nanotubes and composites. Assesses effects of CNTs as reinforcing agents, both in a materials context and an applications setting. Focuses on applications aspects – performance, cost, health and safety, etc – for a wide range of industry sectors, e.g. energy, coatings, defense, electronics, medical devices, high performance sports equipment, etc. Engineers, product designers and product developers working with reinforced polymers in a wide range of industry sectors: energy, coatings, defense, electronics, medical devices, high performance sports equipment, etc. Researchers and students in polymer, materials and nano science and adjacent areas. Patent lawyers and government agencies.